France is aiming to tackle climate change in Africa—and it wants China to help. Last year, China was the biggest producer of greenhouse gas, with its production estimates ranging from 23% to 26.8% of global greenhouse gas emissions. 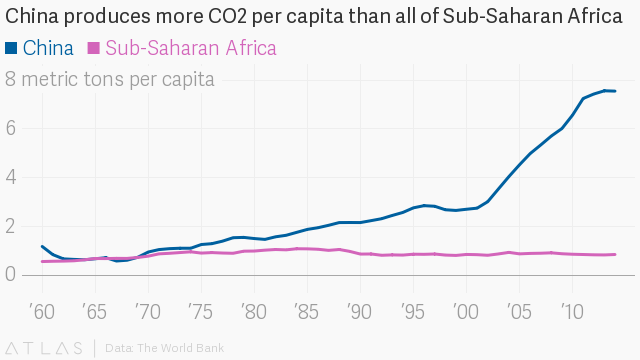 Meanwhile, the entire continent of Africa produced just 3.8% to global emissions. China has become the largest foreign investor and trade partner across Africa in recent years in many countries. It means that increasingly European countries and the United States look to China for cooperation when it comes to African development. Despite making the smallest contribution to global warming and, in turn, climate change, the African continent remains most vulnerable to climate change (pdf). This is in part due to the continent’s high dependence on agriculture and economies based on natural resources. Macron, who called for a “year of ecological transition” has said France could assist China in building a “new Silk Road” in Africa, a project that aims to invest in infrastructure across the continent. Climate and development experts believe Africa is on the right path already. More than 70% of the continent has ratified the 2015 Paris Agreement, says Richard Munang, UN Environment Climate Change Coordinator for Africa. A big promise of addressing climate action on the continent could be to improve food insecurity, which increased last year, with the number of affected people rising from 220 million to 224 million across the continent. “[Our] fundamental rights are non-negotiable, and in this case the aspects that are non-negotiable with the changing climate within the African context are aspects of food insecurity, which…is under jeopardy,” he says.